For electronics, I went with 280 oz, NEMA 23 8 wire hybrid motors, and drivers based on the Sanken SLA7078MPR chip. The power supply puts out 40V and the drivers are configurable up to 3A current. The drivers have step and direction inputs that run great off the Arduino -- just toggle a pin HIGH and immediately back to LOW, followed by a few hundred microseconds delay to control speed. The driver boards also have dip switches to select among full, half, quarter, eighth and sixteenth steps. Mine came set to eighth-step which gives a nice balance between power and smooth motion. Given the low gearing of the lead screw and the 4:1 reduction on the spindle, I'm still experimenting with the best step setting to use on each axis. I may go with quarter or even half step. 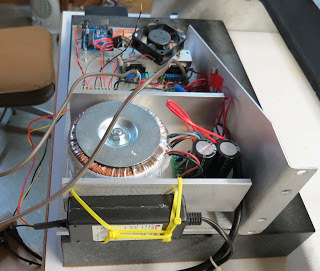 There's a 12v/5v switching power supply from a defunct external hard drive zip-tied behind the big transformer, and it breaks out to power the Arduino, the cooling fan and the logic circuit on the stepper drivers. 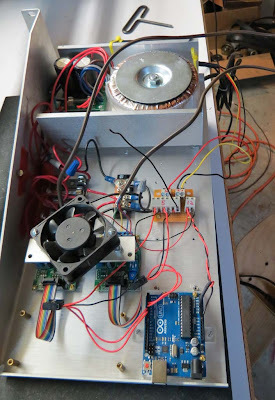 That leaves the big power supply to run only the motors. 12v goes to the Arduino and fan, 5v to the driver boards. I put a diode on the 12v to the Arduino -- when USB was plugged in, but main power off, the computer's USB port was spinning the fan. The diode fixed that and drops the Arduino voltage a bit as well. I've been pretty happy with the hardware so far, and the initial support was good, however the purchase experience was not fun -- sadly, I just can't recommend the company I bought them from. More recycled parts...in this temporary build, the aluminum the electronics are mounted to is a shelf from the telecom rack that supplied the base and rails for the lathe.